Do you ever have a craving for comfort food, one that you just can't shake? 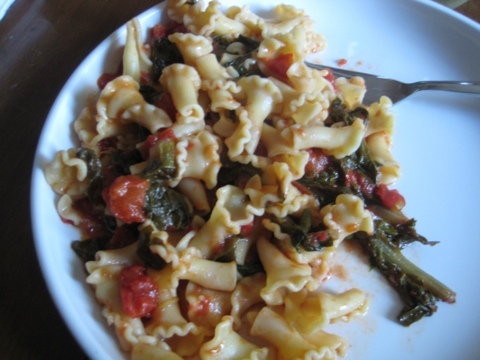 I sometimes crave a good ol' homemade tomato sauce to smother over a bowl of warm of pasta. Tonight, I sautéed 4 large cloves of minced garlic with a glug of good olive oil. Then, I added a large can of organic diced tomatoes with their juices and about a 1/3 cup of red wine and simmered it all for about 20 minutes to let the flavors develop. In a separate pan, I sautéed a large bunch of Swiss chard with some garlic and olive oil. I combined the greens with the tomato sauce, added some kosher salt to taste, and then tore in a handful of fresh basil before tossing it with the freshly cooked pasta. It completely satisfied my comfort food craving and the leftovers made for scrumptious lunches! Mmmmmm.